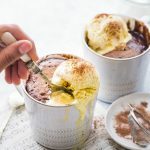 This Microwave Nutella Mug Cake Recipe is a quick and easy dessert when you really don't have fancy ingredients handy. In a large mug, whisk egg, oil, milk and nutella until smooth. Add Sugar & Plain flour and whisk until well combined. Cook in Microwave Oven in high for approx 60 - 90 seconds. Remember to be watchful from 50 seconds. Serve Nutella Mug Cake with a dollop of vanilla ice cream.